In The Butchering Art, historian Lindsey Fitzharris recreates a critical turning point in the history of medicine, when Joseph Lister transformed surgery from a brutal, harrowing practice to the safe, vaunted profession we know today. Victorian operating theatres were known as 'gateways of death', Fitzharris reminds us, since half of those who underwent surgery didn't survive the experience. This was an era when a broken leg could lead to amputation, when surgeons often lacked university degrees, and were still known to ransack cemeteries to find cadavers. While the discovery of anaesthesia somewhat lessened the misery for patients, ironically it led to more deaths, as surgeons took greater risks. In squalid, overcrowded hospitals, doctors remained baffled by the persistent infections that kept mortality rates stubbornly high. 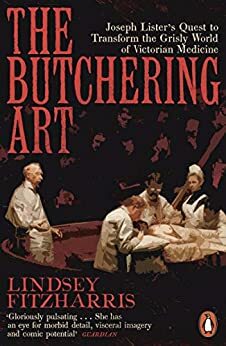 Listed on The Ultimate Buzzfeed Books Guide "for the person whose interests skew morbid"
One of Medscapes' "Books that doctors would love to give (or receive!)" The spellbinding story of a visionary British surgeon who changed medicine forever. This biography on Joseph Lister is an incredibly researched and detailed account of the origins of antiseptic procedures in medicine, which transformed the medical world and saved millions of lives. The author has penned a vivid, nuanced and intriguing landscape of Victorian medicine. I let out a whispered, yet audible "nooooo" when I saw the word "Epilogue". Beautiful, technical writing that's still accessible to the layman. I plan on writing a far more eloquent letter of thanks to Lindsey Fitzharris, Also thanks to previous reviewer, Rosie McClure - there's a YouTube serious?! If you thought battlefield surgery was brutal long before the present, hospital surgery and care was just as horrendous. In detailing the influences and motivations of the most influential doctor of the 19th century with regards to sepsis and antisepsis the reader is immersed in the horrors that comprised the hospital care of the day. If one is naive enough to believe that nosocomial infections are only a product of careless use of antibiotics today, this will set the record straight. It was a hard-won victory to convince such a hide bound profession to accept as truth what the microscope proved. Along the way the reader is given a glimpse of the judicial system and the horrors of the industrial revolution. Extremely well researched and graphically written. Two disclaimers: I have been a RN since 1968. Also, I had originally requested and received a free review copy via NetGalley, but was unable to sight read it. Recently I bought an audio copy and feel that Ralph Lister gave an exceptional audio performance as narrator. I also feel that his British accent is a definite plus. Absolutely amazing book! Not usually a history lover but Dr Fitzharris has written her book in such a way that I didn’t want it to end! As a fan of her YouTube series ‘Under the Knife’ and a medical student myself, it was a perfect way to learn more about the history of medicine. Definitely recommending it to anyone I know! 5.0 out of 5 starsShort, but excellent! It was great to hear the story of Joseph Lister, his family and all his contributions to medicine and surgery. Beautifully narrated, and well written. I'm only sad about the short length - I really didn't want the story to end.